I don’t know about you, but once December hits, I start binging on holiday novellas. I am a total sucker for a warm, fuzzy, feel-good holiday story, especially in These Times and/or around the holidays. We’ve made it past Thanksgiving, we’re currently scrambling to get our shopping done on time (and/or fretting about what to buy people… why are certain family members just impossible to shop for?). In the spirit of giving, I figured I’d enable you by letting you know where to find all of my own holiday stories. • My freebie short, “In December My Heart’s Full of Spring,” is available at the link, both on the website and as a downloadable PDF. It’s about two lonely men who meet on Christmas Eve at the top of the Empire State Building. • “A Walk in the Dark” is a short about how love might just be right under your nose. • Devin December is about a flight attendant and a movie star who get snowed in at LaGuardia on the day before Thanksgiving. And, bonus! Kindling Fire with Snow is not explicitly a holiday story, but it is a winter weather tale of two old friends who get snowed in together. Do you guys have favorite holiday stories? Ones I didn’t write, even? Let me know your favorites in the comments. The original draft of Devin December had an epilogue from Devin’s POV, but my editor thought, and I agreed, that it was too jarring and different from the rest of the book and that it didn’t really fit. However, I am going to make it available to you all for your reading pleasure. You can also download a PDF to make your reading easier. Needless to say, spoilers abound. Devin December is now available!! Happiest of holiday seasons to you and yours. Why not celebrate with some sweet and sassy romance? My holiday novella Devin December is ready for purchase from your favorite ebook store! Makes a great distraction from your family when they start driving you nuts! A freak blizzard strands flight attendant Andy Weston at LaGuardia Airport on Thanksgiving. Tabloid reports about Hollywood It couple Devin Delaney and Cristina Marino breaking up in spectacular fashion keep Andy sane. And then Devin Delaney himself turns up at the gate Andy is working. Against all odds—and because there’s nothing else to do—Andy and Devin begin to talk, immediately connect, and, after Devin confesses the real reason he broke up with Cristina, have a magical night together snowed in at the airport. But the magic ends when Devin boards his flight home the next morning, and Andy assumes it’s over. Then Devin turns up on his doorstep. Andy is game for a clandestine affair at first—who could turn down one of the hottest men on the planet? But he soon grows tired of being shoved in Devin’s closet. As Christmas approaches, it’s clear that this will never work unless Devin is willing to make some big changes. Devin has a holiday surprise in store—but will it be enough? Holiday bonus: Well, kind of. I threw up an excerpt of my current work in progress up on Tumblr, so if you want a sneaky-sneak peek at a future book, check it out. New York at Christmas—Sales, etc. I’ve been procrastinating over the last couple of days by building this mega Christmas playlist, so I’ve been browsing Spotify for songs, and I’ve noticed there are a lot of songs about New York at Christmas. With good reason; New York has some magic to it at Christmas time. Truth be told, though, I’ve gotten a little cynical the last few years. For example, this weekend, I went with my sister-in-law to the Union Square holiday market. It was mobbed. I always get nervous there because I got my pocket picked there once a few years ago. But we had a good time and found a lot of good gifts for our family members. Saturday was also SantaCon, an increasingly insane New York tradition wherein 20-somethings dress like Santa and barhop around the city—it’s like St. Patrick’s Day with Santa suits instead of green, and it goes on all day. It’s one of those things I used to find funny, but when we went to lunch, we saw a girl in a Santa suit already totally wasted… at 2 in the afternoon. But big crowds and drunk Santas notwithstanding, there’s still some magic in the lights and the decorations and some busker playing “Silver Bells” in the subway, and that’s something I try to capture when I write holiday stories set in New York. 1. 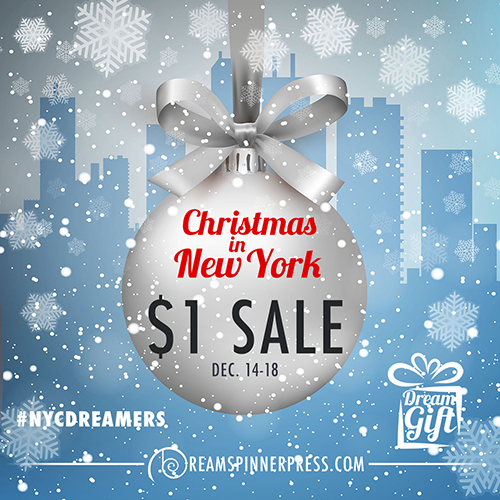 Dreamspinner Press is celebrating Christmas in New York by putting a bunch of romance novels set in New York on sales for $1 each through the 18th. So you can get your mitts on When the Planets Align, my angsty friends-to-lovers tale, for cheap! You can also pre-order my upcoming holidays-in-NYC story Devin December from just about anywhere: Dreamspinner, Amazon, All Romance eBooks, etc. A flight attendant and a movie star get snowed in at LaGuardia in the first part, and get to know each other in NYC during December before they have to decide whether to step out of the bubble of the holidays together or let their holiday affair fizzle. I wish you and yours a stupendous holiday season, no matter what you celebrate! Would you like a very short, vaguely Christmas-related story? Of course you would! A tiny bit of background: I’ve been turning over ideas for a story that takes place in New York in the 70s, and also feeling sort of sad that I didn’t get around to writing a Christmas story this year. Then both of those trains collided, et voila! Here are 830 words on the theme of people who are down on their luck on Christmas Eve, something I apparently keep returning to. So, think of this as New York in the bad old days, Greenwich Village in the wake of Stonewall, a city in decay. This is the tree in my apartment. My cat keeps getting ahold of the tree skirt. 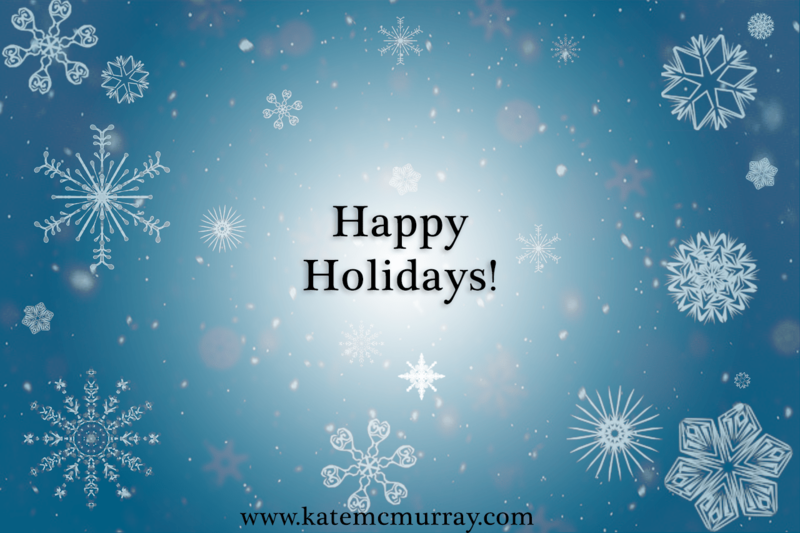 Warmest holiday wishes to you and yours! It’s been a strange holiday season in these parts. Not everything has been pleasant, but I’m looking forward to a few days off and even to getting out of the city for a bit (I’m going up to New England in a few hours to spend the weekend with my dad, et al). My siblings and I will all be in one place, which doesn’t happen that often, so I’m looking forward to that. All my presents are wrapped, and I baked some snickerdoodles, so all that’s left to do now is to get on a train. This has been a really amazing year for me, and I find myself introspective at the holidays. I’m so grateful to so many people who were encouraging and supportive and awesome and helped make a lot happen this year, and I, for one, am really looking forward to 2012. I feel like the possibilities are endless. Which is a nice way to feel at the end of the year. Anyway, in honor of the holiday, I thought I’d give you guys a terribly romantic scene from my WIP sequel to In Hot Pursuit. This scene might get cut, actually, depending on how I go with the revision, but here’s a little taste of what happens to Harry and Noah a couple of years after the end of their novel. For the first five years I lived in New York City, I worked in an office near the corner of 42nd Street and 5th Avenue. If you need a landmark, the New York Public Library is right there (the iconic building with the lions out front). I was also right down the street from Saks and Rockefeller Center, so the whole area was abuzz with activity during the holidays. It was a boon and a bust simultaneously. I have a hard time with big crowds, and there were times when I’d be out to lunch and I’d look up 5th Avenue and see that sea of people crowding the sidewalk and feel overwhelmed. On the other hand, I still think there’s something magical about the city at this time of year, and I’d see glimpses of that and feel some measure of joy. I like things that are simple: someone changing the glass in the chandelier that hung at the entrance to my office building from white to red and green; a guy playing “Silver Bells” on a trumpet for pocket change; the way the lights reflected off all those glass office buildings in midtown. I’m thankful I don’t work in the middle of everything anymore, but I miss it sometimes, also. 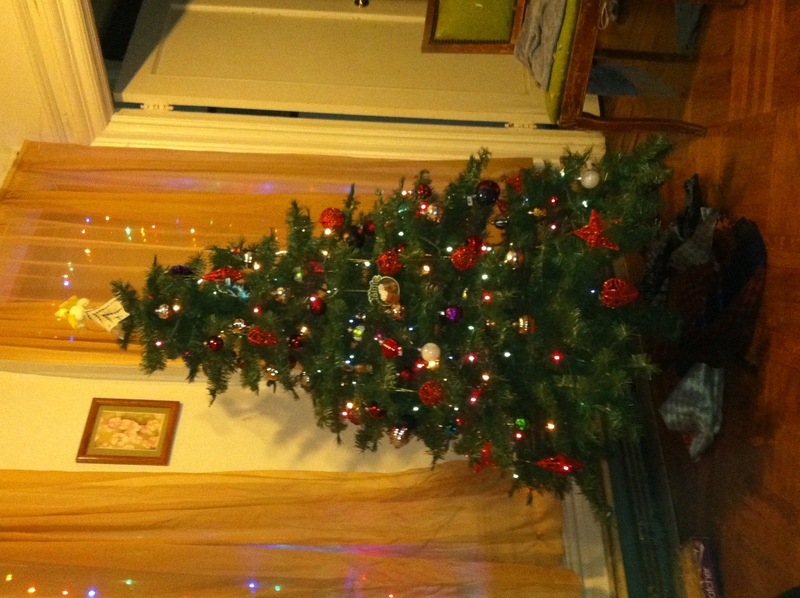 Still, there’s something kind of charming about Brooklyn during the holiday season. All those brownstones with tasteful wreaths or garlands out front makes my neighborhood feel very Victorian to me, like I’ve walked into a new movie version of A Christmas Carol. Sure, you get the people who have Santas hanging off their balconies and plenty of tacky flashing lights, but there’s this one house near my office that’s just gorgeous, with old fashioned decorations hanging from the gas lamp in front of their front stoop. It’s nice to think about that, as I’ve felt a little grinchy this year. Saturday, I went with a couple of friends to the Central Park holiday market, a European-style open-air market near Columbus Circle. Sometimes there’s magic to be found there, too, but mostly I was too distracted by the crowds and my need to find some last-minute gifts to find it. I’ll start looking for it again, though. In book-related news, my upcoming novel The Boy Next Door went off to the proofreader a few days ago. I saw the initial cover mock-up, too, and it looks great! (I’ll post when I get the final.) That will be out from Loose Id on January 25th. It’s about a man who moves back to his home town and winds up living next door to his childhood friend (and teenage crush). I’ll have more to say about that as the release date gets closer. A LOT of work went into this novel, so I’m glad to see the light at the end of this tunnel, and I’m really excited for it to finally be published.